Consider this printed paper goods endeavor a happy collision of two seemingly un-related businesses melded together by an appreciation for a good laugh. Spawned by collaboration between the founders of a t-shirt company and a craft brewery, the partnership is believed to be the world's first and only printing house and greeting card company owned by a craft brewery. The resulting cards and poetry are fantastically uproarious, unique, and worth beer-fueled exploration! At CTA, we often say that while we take our beer and business very seriously, we never try to take ourselves too seriously - be it in regard our beer names or merch or promo banners featuring a shirtless Vladimir Putin nuzzling up to some cute lil' dolphins. That same spirit lies in Call to Arms Presswork (CTAP) and KWART Greeting Cards. We wanted to launch a printing house that could offer professionally-printed greeting cards, poetry collections, posters, comics, short stories, etc., while still maintaining a lighthearted, tongue-in-cheek undertone. Troy Vigil (of "Tee Roy Tees" fame) helped bring CTAP to life through KWART by offering his unique vision of the world via talking condoms and intoxicated dinosaurs. We're the worlds first and only printing house and greeting card company owned by a craft brewery. Apart from the Denver Flea, we always sell close to a dozen different KWART cards and a half-dozen poetry books in the CTA taproom. Each greeting card comes with a CTA sticker and a temporary tattoo featuring Troy's alter ego, Franklyn the Talking Condom. Mr. Troy find his inspiration in in the subtle-yet-well-pronounced awkward moments of every day life; those small observations one may witness on the bus or while waiting in line for coffee - or during a particularly pensive shower. Much of Jesse's inspiration lies in the quirky marketing campaigns of yesteryear and having CTA as a vehicle to offer the craft beer consumer much more than glasses full of carbonated malt soda. Troy's tee shirt company, Tee Roy Tees, is now in its third year, and he spends every free minute expressing his often-inappropriate thoughts through small sketches - the most dynamic of which end up on a new tee or greeting card. 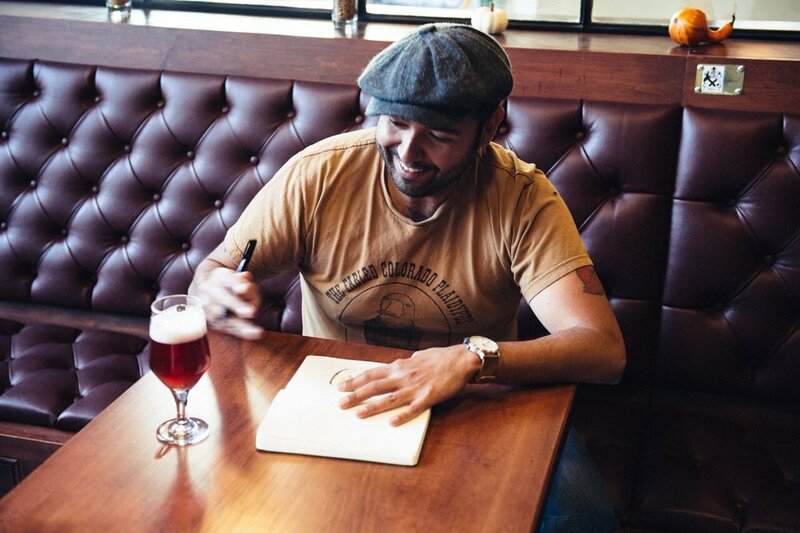 Jesse spends his hours at Call to Arms planning taproom events, drinking girthy 10 ounce servings of Clintonian Pale Ale, and planning the next offshoot under the CTA umbrella. Occasionally we bring these two worlds together to further the KWART brand - which is set to include post cards and short stories in the coming year. The Artist Formerly Known as Troy drew his first cartoon once upon a pint ago on a bar napkin to draw a laugh out of his friend Dan (who is an rather easy laugh, by the way). From there he would spend his free time in his cubicle doodling on printer paper, wallpapering said cubicle with off-beat images with dreams of spreading them throughout the world. Jesse went to school for graphic design before entering the beer industry in 2001, and when Call to Arms became a reality, the doors of creativity were viciously flung open once again. While Troy is never one too brag, but he's particularly fond of taking 11th place at the 2013 Mr. Olympia competition. Jesse's rather proud of his flannel collection.